Nokia Lumia 710 has a tall task at hand. The second brainchild of the Nokia- Microsoft partnership is the budget-friendly option in the lineup. It will try to entice first time smartphone buyers, while battling the Windows Phone establishment in the face of HTC and Samsung. 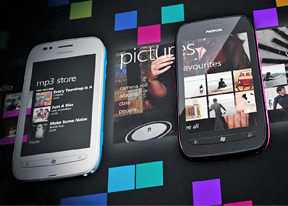 While the upscale Nokia Lumia 800 is clearly the object of more attention for its impressive build and superior features, the Lumia 710 is expected to sell in bigger numbers and perhaps bring higher profits. From a business perspective, the smartphone is even more important than its flagship sibling. Just don't take the budget reference to Nokia Lumia 710 at face value. Because of Microsoft's strict hardware requirements for the Windows Phone platform, the smartphone has the same 1.4GHz Scorpion CPU and 512MB of RAM as the Lumia 800, therefore promising identically smooth handling. In order to maintain the budget status and keep the price down, Nokia Lumia 710 has less built-in memory, an LCD screen instead of AMOLED, and a 5MP camera. Its design is less ambitious than the flagship's, but the Lumia 710 is still solidly built, even if not as good looking. The level of equipment sets the Nokia Lumia 710 on a collision course with two major rivals in the Windows Phone realm - the Samsung Omnia W/Focus Flash and HTC Radar. The Finnish offering however, has a few exclusive software tricks up its sleeve, which are expected to give it a slight edge over its rivals. The most prominent of course, being Nokia Drive - the exclusive and free lifetime navigation service. As far as hardware goes, the three devices are almost identical, save for the screen technology and choice of finish. As always, we are going to continue our encounter with Nokia Lumia 710 with an unboxing, followed by the design and build quality overview.